Everything is finally in place to manufacture replacement one piece fuel filler pipes in aluminium for the classic in accordance with LAA Standard Mod 13070. Due to the fabrication process requiring a set up charge it will be uneconomical to make less than 10 parts and a higher volume will help reduce the price. The parts will be supplied with the excess material needed to form the tube and will require cutting to length to suit your installation requirements. To instal the tube you will require two short lengths of hose, 2 jubilee clips, potential suppliers are given in the mod. I estimate that the part can be supplied for about 230 GBP plus postage. Each owner must determine the requirements to install this mod in their aircraft. If you would like to acquire one of these tubes please PM me with your contact details and quantity required by the 15 January 2018. To help ascertain whether this is the correct pipe for you please find attached a drawing. Here's mine which I was lucky enough to obtain from dear Nev. It has LAA mod approval, but I can't give any of its history. Sorry. Due to the number of owners showing interest and assuming they are converted into orders the price has been reduced to 195 GBP plus postage. The reduction of course applies to the those who have already signed up! Hello to All and best wishes for 2018! This is a last call for Classic Europa owners using the long rubber centrally mounted fuel filler hose for one made of aluminium. A batch will be ordered in a couple of weeks, further batches will require a minimum quantity of 10 off. If you think it will be necessary to change yours any time soon this might be the occasion. The tube will cost £195 or €214.50 plus postage. Postage within France is €25 and to other European countries €30 (£27.25) which includes insurance for €200. 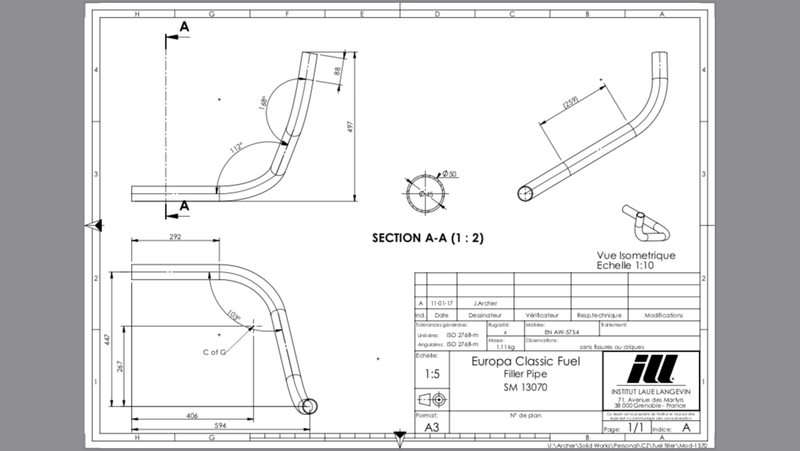 I have had a several requests for information about the aluminium fuel filler pipe for the Classic Europa, owners using the long rubber centrally mounted fuel filler hose for one made of aluminium. A new batch will be ordered when a minimum quantity of 10 has been attained. If you think it will be necessary to change yours any time soon this might be the occasion and of course periodical hose replacement in the future will be with straight hose sections only! The tube will cost £195 or €214.50 plus postage. Postage within France is €20 and to other European countries €25 (£27.25) which includes insurance for €200. I have 4 people on the waiting list for fuel filler pipes according to SM 13070. Some of them were told "times up" by their inspectors on their now 20 something year old rubber hoses and the aircraft grounded. If you have a Classic fuel filler system you will require a replacement sooner or later. Price will be the same as last time 195 GBP plus postage. This mod will permit the the connecting hoses to be replaced every 5 years along with other fuel hoses as only straight sections are required. Please let me know if you are interested and I will give an update shortly? 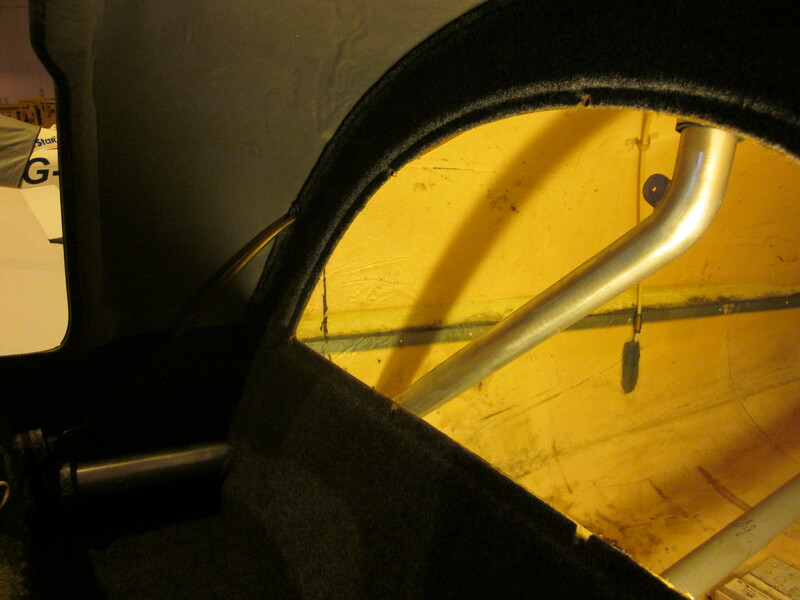 Hello, This is a last call for anyone who has a classic Europa to replace their fuel filler pipe. If you want to replace your 20 year something original with an aluminium one. Price hike to 250 GBP due to low order volume. Please PM me for more information.